Who doesn't feel stressed nowadays? We feel pressure to perform and be successful in many aspects of our lives. Water features are a perfect stress-relief solution homeowners will love to gaze upon. We discuss two designs that will turn a front yard, or a backyard, in a peaceful oasis. Once in a while, we need an escape from our everyday lives. We go to the spa, we plan a weekend of hiking, we take a week of vacation in the Bahamas…Everybody is different and have their own ways to unwind. How about offering your clients a peaceful stress-relief oasis they won’t go far to enjoy? No wonder water features are gaining so much popularity! Gazing upon them or opening your ears to their music provides homeowners with an instant feeling of relaxation. The next water features can be added to the front yard, the backyard, or both! Get creative and show your customers that you care about them by proposing healthy features for their outdoor living. Compared to round and hexagonal basins from their competitors, AquaBasin® from Aquascape have a water conservation advantage. 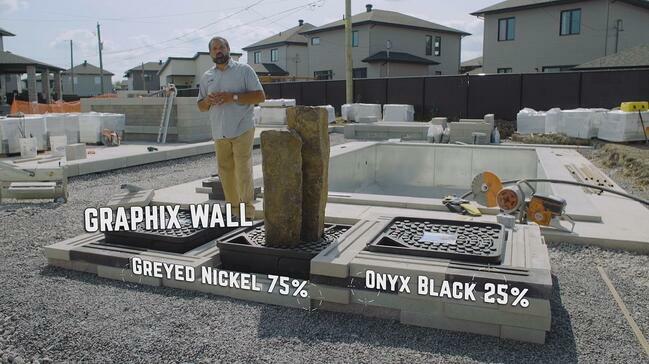 To simplify the construction process and provide a unique elevated look to the homeowners, the 3 AquaBasin® we used to build a Graphix Wall water feature were placed above grade. Our Graphix Wall blocks showcase an exclusive in and out appearance and a color we call salt and pepper, obtained by mixing 75% Greyed Nickel units with 25% Onyx Black units. Above these basins, many options of material can be added for a one-of-a-kind water fountain: architectural stack stone walls, urns, spheres, etc. You can choose to install spillways or water gardens. For this project, we selected Mongolian basalt stone columns to complement the Valet pavers we have peppered throughout our installation. Looks amazing, doesn’t it? Not only does the three columns provide an exceptional appearance, but also the lighting doesn’t let its beauty fade at night. Push the darkness away with In-Lite products. Do you want to be the contractor that stands out from the rest? Those outdoor fountains are easy to build and last forever when you follow the proper steps. How about a water FIRE feature? 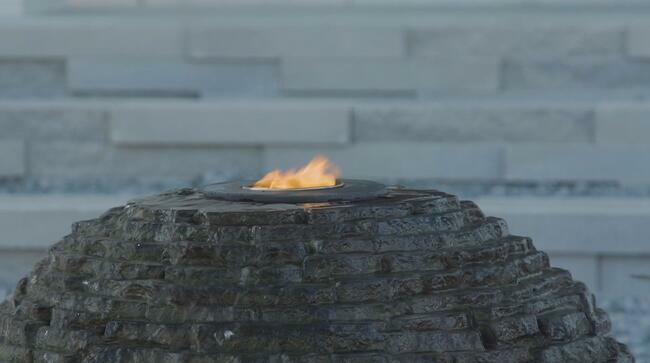 Placing a water fire feature as a focal point is becoming a trend in landscape design. Bringing together two opposites sure creates a mesmerizing effect, and our partners from Aquascape make it possible! 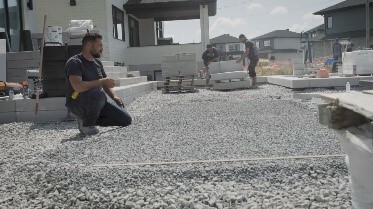 To build this outdoor fountain on the front yard of these homeowners, we again selected an AquaBasin® that has an irrigation system auto refill. 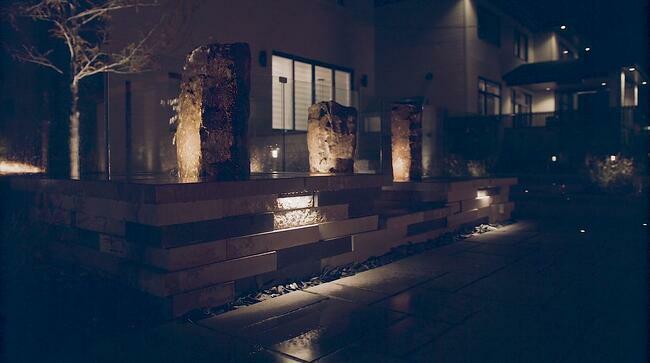 Using a simple drill and the dimples in the top of this AquaBasin®, we were even able to add LED lighting in this garden fountain easily. The basin comes with a panel that provides access for maintenance in the winter months, which homeowners won’t need to worry about too much because the system is virtually maintenance-free. 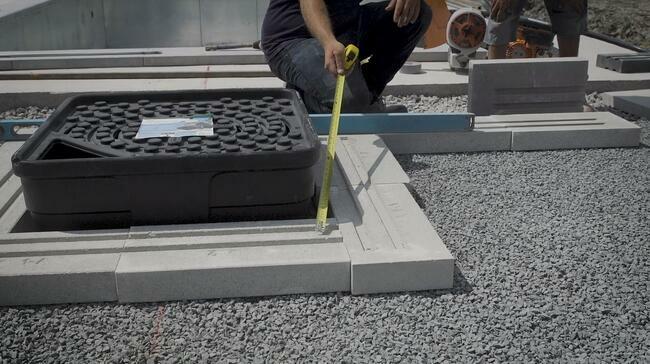 Plus, HDPE construction is durable and protected by a lifetime warranty. 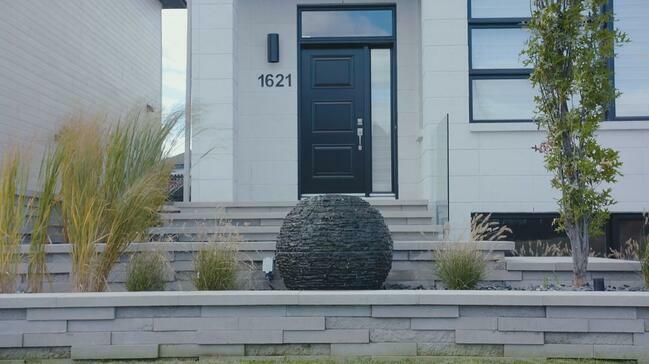 An even more distinguished look can be created by incorporating decorative gravel. They usually come in many options of texture, color and scale. What a fantastic way for homeowners to welcome guests to their home! WE FEATURE MANY OTHER UPSELLING IDEAS IN OUR SUPPORT MANUAL. DISCOVER HOW TO BUILD THEM TODAY!